OSHA has adopted hazardous chemical labeling requirements as a part of its recent revision of the Hazard Communication Standard, bringing it into alignment with the United Nations’ Globally Harmonized System of Classification and Labeling of Chemicals (GHS). These changes help ensure improved quality and consistency in the classification and labeling of all chemicals. As a valued customer, INX wants you to know that we have complied with the deadline and have begun to incorporate the mandated changes on the product labels and Material Safety Data Sheets (MSDS) that accompany our products. 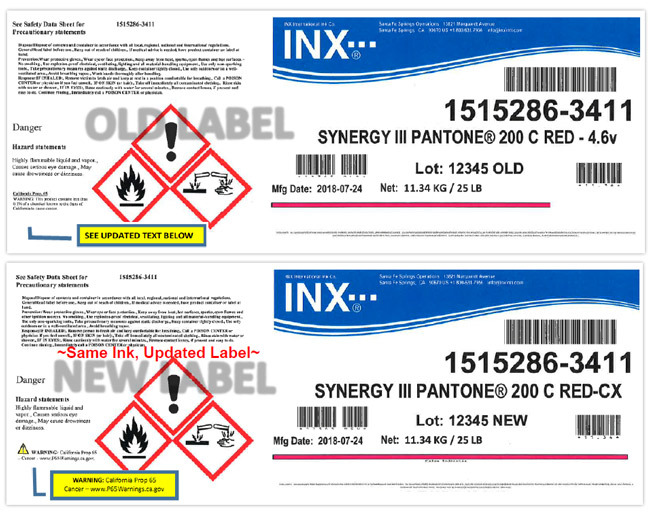 As GHS requires, new INX labels will have a uniform or harmonized appearance and a standard set of information. In addition to new labels, the long used MSDS format has been changed to the Material Safety Data Sheet (MSDS) format that has a different appearance and content. The new elements aim to help communicate the hazards associated with the product and the safety measures that need to be taken when handling or transporting it. OSHA requires that these five elements appear on all Hazard Communication Standard (HCS) labels; pictograms, a signal word, hazard and precautionary statements, the product identifier, and supplier identification.